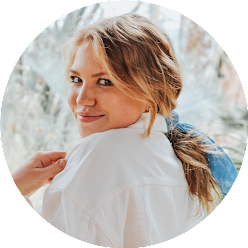 For my final college collaborative post with Caroline, Renee and Nicole, I'm excited to share my bucket list for freshman year! I've heard of so many fun and unique Lehigh traditions, as well as typical college experiences, and I definitely want to take full advantage of as many cool opportunities as I can. I've always envisioned myself in a sorority, and I'm really excited to rush second semester! I think it'll be a great way to make even more friends, be social, and be a part of a really cool network. 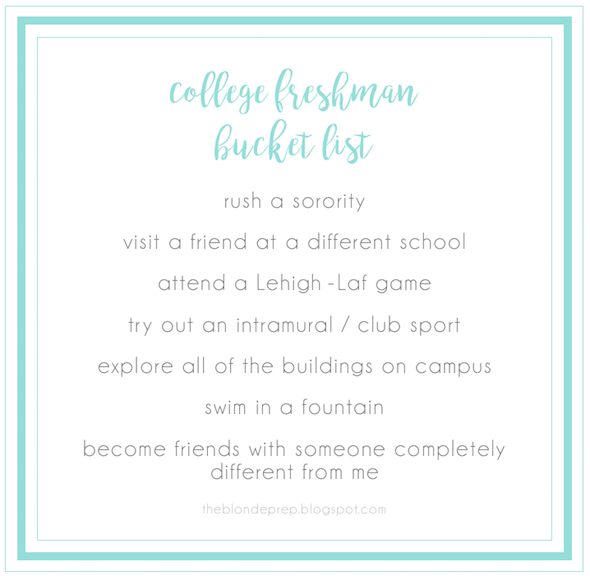 I definitely want to visit a few of my other friends at different schools, as well as explore my own school by taking a peek into each building, swimming in one of fountains at Lehigh, and befriending someone totally new! Colleges are so diverse and I really want to try to branch out as much as possible. What is/was on your college freshman bucket list? Anything I need to add? Make sure to check out Caroline, Renee and Nicole's lists too! It was so fun collaborating with them this week. You're going to have an amazing four years! The bucket list looks great - although I will also recommend adding to it that you have to find your favorite late night dining hall spot/food, and your favorite delivery food from off-campus for study sessions or slow mornings. I'm SO glad to see you're planning on joining a sorority - by far the best decision I made in college! Have so much fun!